The Pool Patrol PA-30 Pool Alarm floats on the pool surface and will activate when children or pets fall into the pool, creating a wave. The Pool Patrol Pool Alarm emits a warning alarm when the wave touches the sensing ring of the pool alarm. This triggers the alarm, which emits a clear warning signal. The sensing ring is adjustable so that it can be controlled to activate only when an object the size of a child or pet falls into your pool. 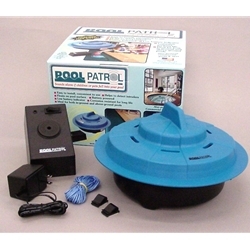 The Pool Patrol Pool Alarm is designed to work in any shape pool. For pools larger than 20' x 40' more than one alarm may be required for greater security. The Pool Patrol comes with easy-to-use tie-down strings and hooks. This enables the Pool Patrol to be secured to the side of your pool. This pool alarm is easy to install, convenient to use, and corrosion-resistant for long life. It helps detect intruders. The PA-30 floats on the pool surface. It is battery powered and has a Low Battery indicator. It is ideal for both in-ground and above-ground pools, as well as commercial pools and spas. The PA-30 Pool Alarm is the deluxe model with an electronic solid state remote receiver. An alarm will sound both in your pool and in your house up to a distance of approximately 200 feet. The remote wireless receiver has an on/off switch with an "on" indicator light and is powered by a 120 volt A.C. wall transformer. The alarm in the pool is battery powered and uses one 9 volt alkaline battery (battery not included). Packed one per carton.